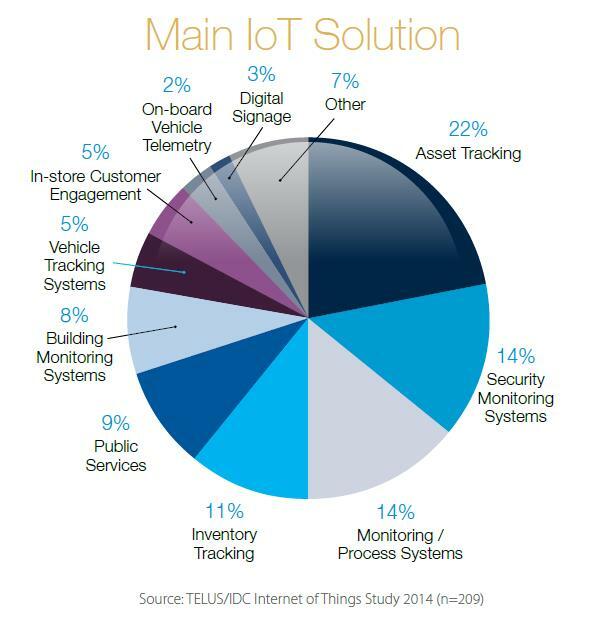 Telecom provider @TELUSBusiness recently worked with @IDC to benchmark the state of the Internet of Things (IoT) for Canadian businesses and they came up with some interesting findings. These numbers suggest that IoT is still in its infancy in Canada and there is still much opportunity for solution providers to gain market share. So in which applications does the report see the most growth? According to the study the main IoT solutions include asset tracking, security monitoring, monitoring process systems, inventory tracking, public services, building monitoring systems, vehicle tracking systems, in-store customer engagement, on-board vehicle telemetry and digital signage. The drivers for implementing IoT solutions ranged from greater productivity, improved quality of service, improved security, greater reliability, cost savings and faster decision-making. But the number one and two drivers varied by vertical. For example Primary industries (like Oil and Gas) ranked cost savings as number one and greater productivity as number two while Utilities ranked improved quality of service and faster decision making as their top two drivers. Regardless of industry, the report found that security was a top consideration for Canadian CXOs when looking at new technology. Security of the devices, the connection and the data are all considerations when looking at IoT solutions and require multiple departments within an organization to weigh-in when assessing which solutions to implement. Despite the early stage of the industry in Canada, there is much hope for growth. According to the report, spending on IoT solutions is forecast to grow from $5.6 billion in 2013 to $21 billion by 2018 in Canada alone. I recommend that you browse through the full report which can be found here.